Happy Saturday. Any fun plans for the weekend? It is a cross-country race for my two youngest children today. I wonder if they come back all muddy? We have had microwaves for years and years and I never really thought that we used them that much. I like to cook from scratch so I thought it was not a kitchen essential. So when our microwave door broke a few months ago, I wasn’t too upset. It freed up some space on my worktop, more room for baking! “We do not need a new microwave, we can manage without it”. In hushed tones, my Hubby may have been right saying you will be surprised how often we use it. Sshh do not tell him!! That leftover pizza or pasta or that extra plated Sunday dinner just ends up in the bin. Reheating is great with a Husband on shift work. It turns out the last few months have been a pain not having a microwave. I am so used to cooking for 6 at meal times, even though my eldest two are at Uni I can’t help myself. So without a microwave that leftover food ends up in the dog. I am sure she does not want us getting a microwave!! Then if we get a surprise visit from my Sons I have to make them a meal from scratch. More work for Mum. The simple little things you miss. What time is it.? The aforementioned leftovers. Pre-cooked rice packs, porridge and mostly melting cheese on our corn chips!! Me and my Daughter’s favourite weekend treat is not the same without melted cheese on top. It even came in handy for warming drinks up that have gone cold, warming milk for hot chocolate and heating lemonade up when someone has a sore throat. Not to mention making popcorn. One of my Daughters favourite gluten-free treat recipes. No popcorn on movie night!? I even cooked my Husband some sausages a few days ago to warm up when he got home, forgetting we had not got a microwave!! I am not the only one who has done this though. My eldest Son did it when he came home last time. Ha, thankfully I am not losing the plot yet. 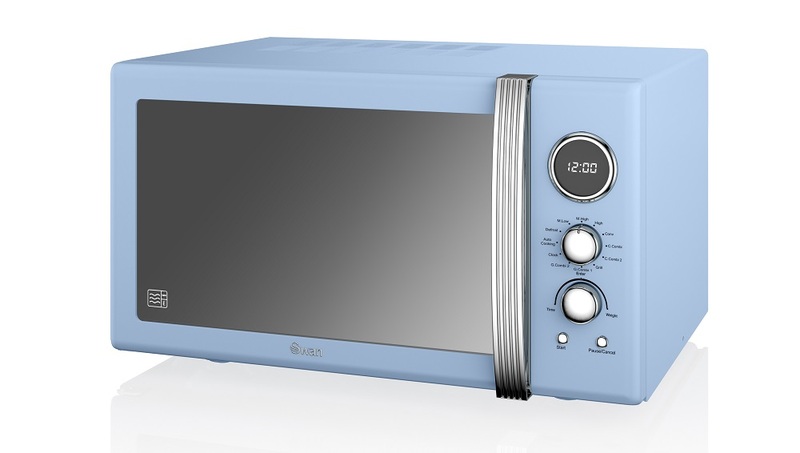 Earlier this week I got the chance to pick out this beautiful Swan microwave to review. It also doubles as combination oven and grill. How lucky. I have never had a combination microwave and I was really excited to get started. How amazing is the colour!? I have always loved a splash of colour and this microwave comes with a host of beautiful colour options including pastel pink and shiny black. On with the cooking! I made some really quick and easy cakes. My Son was coming home yesterday to spend some time with us before his 21st birthday and I always make the children these cornflake buns every year. Why they taste greeeaattt! We all love them. In a microwaveable bowl break the cooking chocolate up into small pieces. Pop the bowl into the microwave and heat for 60 – 80 seconds on medium heat (depending on chocolate.) Stirring every 20 seconds to prevent it from melting to much and burning. Pop your cornflakes into a big bowl and once the chocolate has melted, stir it and pour it over the cornflake and stir well until all cornflakes are covered. Pop 12 fairy bun cases into a muffin tray and divides the mixture between the 12 cases. Next up I made a few different mug cakes in the combination oven. Firstly I grilled one by mistake, ha! I thought I could smell burning. Then I accidentally part grilled one and part oven baked one. That did not turn out good but eventually, it was 3rd times a charm!! As I found there are lots and lots of settings on the Microwave. The Hubby loves it as like most men he loves playing with gadgets. 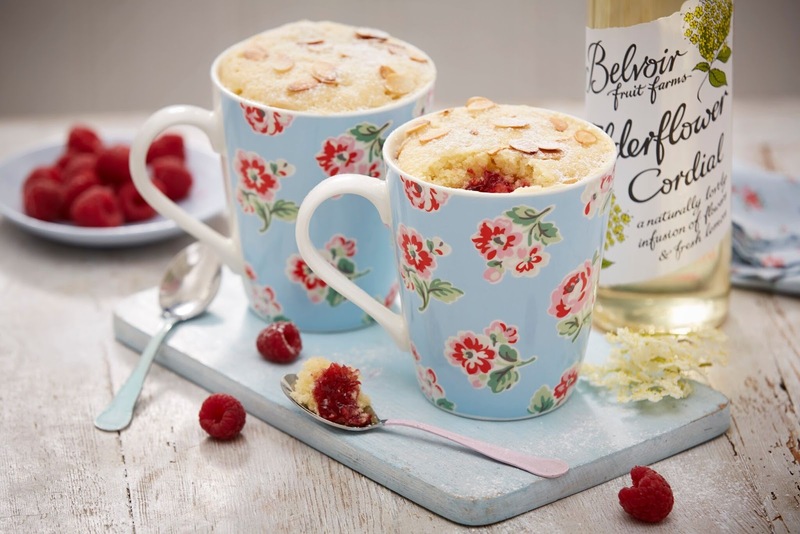 I need to try this mug cake next: How To Make Elderflower Bakewell Mug Cakes. A great helping hand in the kitchen, this 900W combination microwave benefits from convection, standard microwave and grill options making it ideal for browning, roasting and baking a variety of different dishes with ease. It has a convection programme that uses a fan to envelop the food, quickly browning and sealing in moisture for added flavour. The grilling option ensures golden toppings, crisp pastry and bases. Both these programmes also use the traditional microwaving method to ensure that the dish is cooked through. Other features include a generous 25 litre capacity, which can easily accommodate larger plates of food, temperature controls, a digital display, defrost function, 60 minute timer, pull handle door design and 12 automatic cooking programmes to take care of a range of dishes from vegetables, rice, pasta and popcorn through to pizza, potatoes and even bread! Available in a host of colours including sky blue, delicate green, rich red, traditional cream, contemporary black, pebble grey and pastel pink, Swan Retro provides a stylish vintage charm, which is perfect for both modern and traditional style kitchens. After a few hit and misses with the mug cakes, I decided to oven bake my cake in the combi oven mode on the dial. I made this Victoria Sponge Cake Recipe. It turned out OK but as they say, practice makes perfect. As I love cake, I will be practising a lot!! I can not wait to bake some more cakes now, but I have to wait until all these have been eaten first. Guess who is having melted cheese onto of corn chips later tonight!? Simply sprinkle the nachos with grated cheese, pop in the microwave for around 30 seconds until melted, then add lots of yummy dips on top. Delicious. I am really pleased with the microwave and adore the colour. I am enjoying learning about all the settings and all the things you can cook in it. The instructions inside are easy to follow and there is a variety of easy to use programs. I have not had a grill for years as my main oven is just built in. So grilled cheese on toast is on the menu over the next few days too. I am now trying to talk my Husband into buying me the match coloured kettle and toaster!! Watch this space. I was sent a microwave to review. All thoughts are my own and I was not paid for this post. Thanks for supporting the brands I love. Perfect Pancakes with Shaken Udder: How Fun!? "How To Make Iced Gaelic Coffee: Coffee And Irish Whisky"
"5 Black Friday Hacks And Money Saving Tips"
Oh I love the colour you choose. It's very retro looking. We don't have a microwave at the moment as we have limited counter surfaces at the moment but I could easily decorate our next kitchen around one if these! It is lovely, isn't it 🙂 Thanks. I haven't had a microwave since moving a few months ago and it can be really annoying! It takes so much longer to heat up milk and baked beans etc on the stove! Love the colour of this one! wow! I like the colour. It looks a bit vintage! You def need to convince your husband the kettle in the same collection! I don't know how we ever managed without a microwave, especially with the kids. So handy e.g. for heating up leftovers, or a quick mug of hot milk at bedtime, without creating additional washing-up by having to get out pots and pans. Yes, they are great for quick jobs without the mess. Oh forgot to add how easy porridge is ni a microwave. It was so much effort and soaking pans without it. Oooh that has got to be the prettiest microwave ever!! I love it! Sadly it wouldn't match our kitchen, boooo! What a stylish Kitchen microwave, I think mine has a lot of style missing next to this and what you produce in it is amazing #TriedTested. Thanks Zena. I can't believe I managed without for so long. That looks like a seriously swish microwave! I'd make room in my kitchen for that. I got rid of my old one years ago and never replaced it. Haven't missed having one, tbh!